Most striking in this nativity scene is the dominating position of the donkey and the ox. Joseph has fallen asleep but Maria gives all her attention to the newborn child. The child lies on a slip of Maria’s mantle and is naked. Therefore it very much needs the warmth of the donkey and the ox through their breath expired in the direction of Jezus. 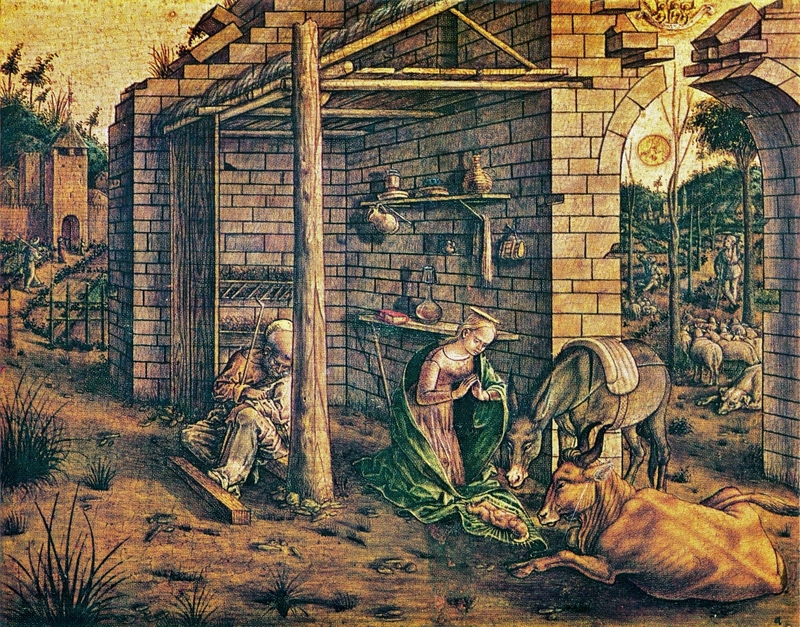 The artist has chosen to emphasize the role of the animals in this nativity scene. The donkey and the ox are the only creatures who can assist Maria in the care for her child in these circumstances. The artist has given us an example of the interdependency between man and animal. This example is time-bound and will not happen in our time, but the value of the animal for the well-being of man is still a reality. Carlo Crivelli must have been aware of this significance of animals in man’s society. Although the donkey and the ox are present on the background of most nativity scenes , this particular painting highlights their role and emphasizes their importance.